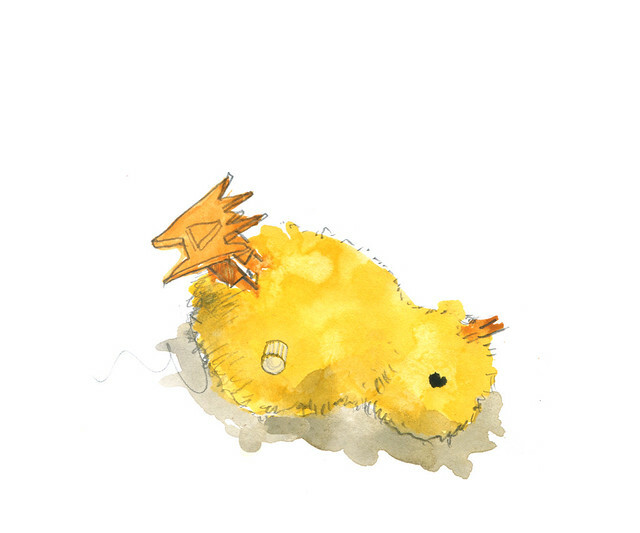 Oh poor little chick, I feel so sorry for him lying there, abandoned, alone, lost, no one cares!! -I'm getting carried away here :) That's the power of a great painting. I see you putting together a story of all the abandoned toys in your house! lol. i have a new respect for toys every since i saw the pixar short: http://www.pixar.com/short_films/Theatrical-Shorts/Tin-Toy. Oh my gosh, this is a delightful painting! That's so creative and unique that you saw the potential for a painting in that little chick! A whole series of strewn toys would be awesome too! Comme je comprends votre ressentiment !!! L'image de votre adorable dessin va me poursuivre encore aujourd'hui !... Je pense que je vais souvent penser à vous à chaque fois ! Hey! I have this chick (for no specific reason it's lying in our fruit bowl). I'm gonna take a picture and post it on my blog: grlzonwheels.blogspot.com. Nice drawing, small world. Hang in there Susanne! Being a mom to twin boys is enough to exhaust anyone, much less the amazing pursuit of your artistic dreams! I hope you (and Edgar) can let yourselves rest some. Love, love the drawing of this chick!